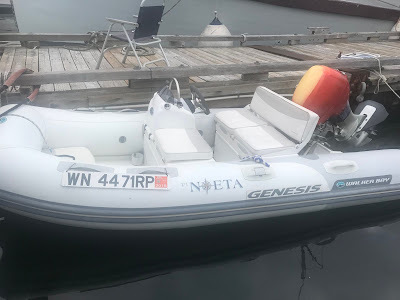 T/T Noeta is our dinghy (T/T means Tender to) she is an inflatable 10 ft 6 in Walker Bay Genesis. Pretty soon, she will be more like our car than our dinghy. When living aboard and cruising to new locations, often times a dinghy is the only way to get to shore, meet other cruisers and go for evening happy hour cruises. We MUST keep her safe and usable. One concern, when a cruiser has a nice dinghy and outboard motor, is theft - usually of the motor. We do plan on hoisting the dinghy out of the water and locking both tender and motor up, but we came up with one more way to make her less desirable to would-be thieves - paint the outboard to make it recognizable, less obvious as to what make and horsepower it is and more difficult to pawn. After Pat peeled all of the name brand stickers and horsepower size off of it, we gave the painting task to our artist daughter Hailey. Watch the video to see the outcome. Now, originally we wanted to make it ugly so no one would want it, but now it's beautiful and unique. Now we'll known as the cruisers with the fat cat AND with the cool outboard.